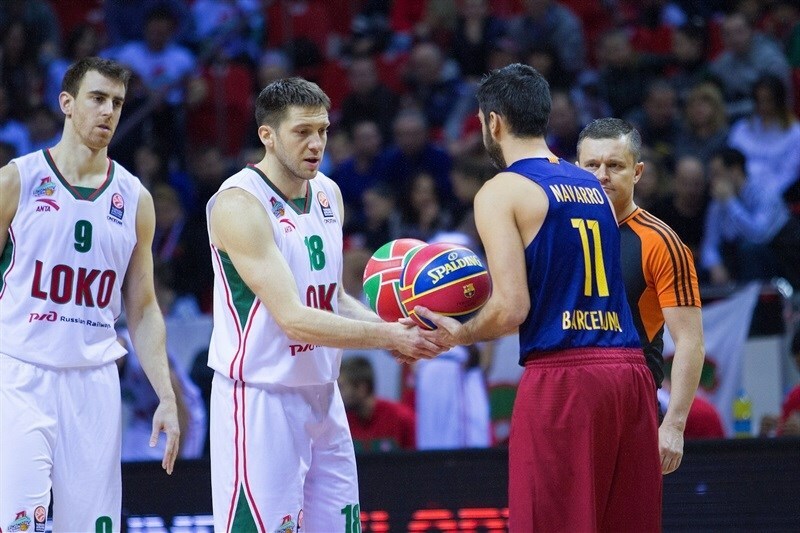 Lokomotiv outlasts Barcelona 78-74 to win Group C! 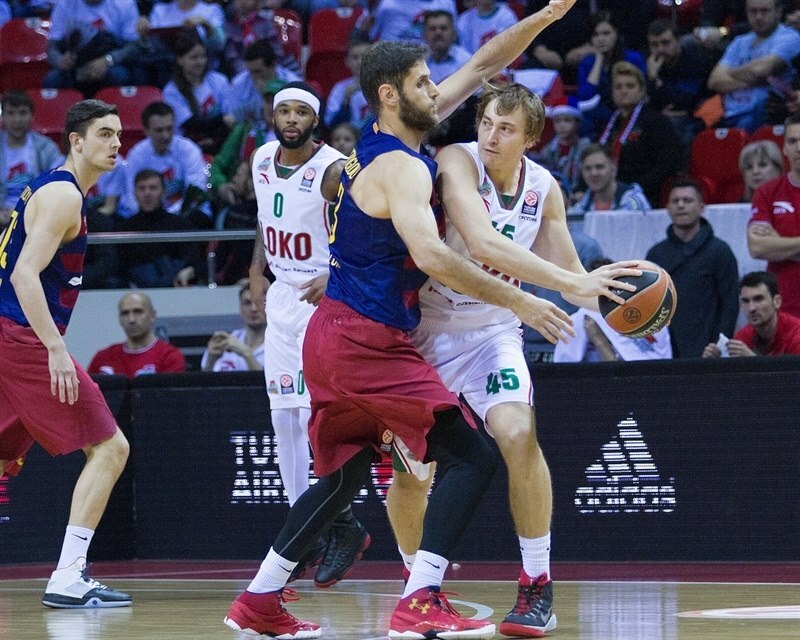 In a thriller that whetted appetites for the upcoming Top 16, Lokomotiv Kuban Krasnodar battled visiting FC Barcelona Lassa into the final minute Friday before taking a 78-74 victory that clinched first place in Group C for the hosts. 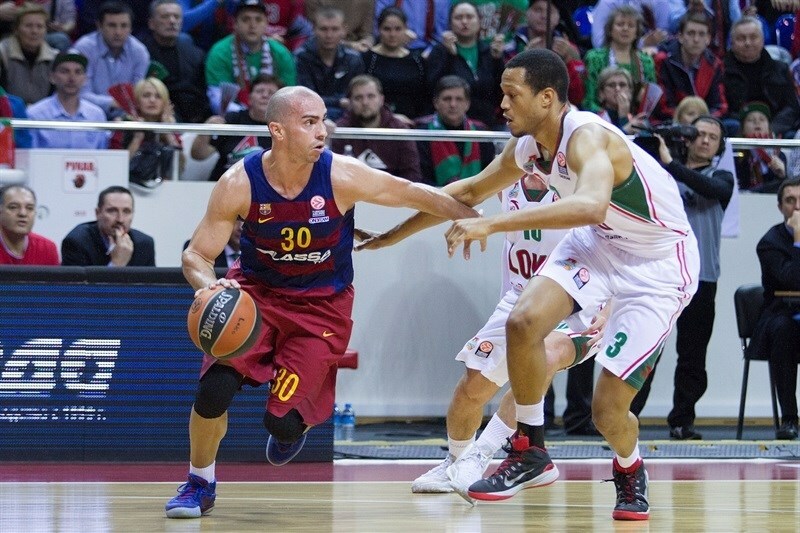 Lokomotiv finished with an 8-2 record while Barcelona fell to 6-4 but won its second-place tie with Panathinaikos Athens on point difference in their head-to-head wins against each other. 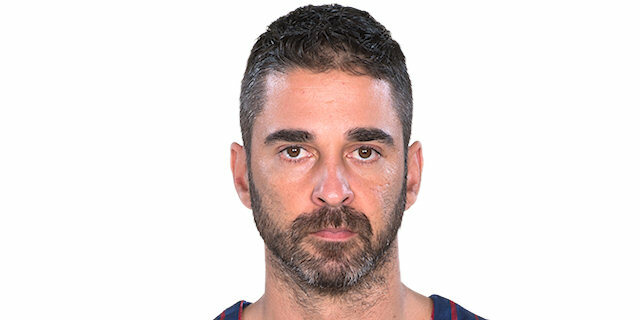 Barcelona finally took control of a back-and-forth second-half scoreboard as Juan Carlos Navarro's fifth three-pointer in 10 minutes made it 54-63 early in the fourth quarter. 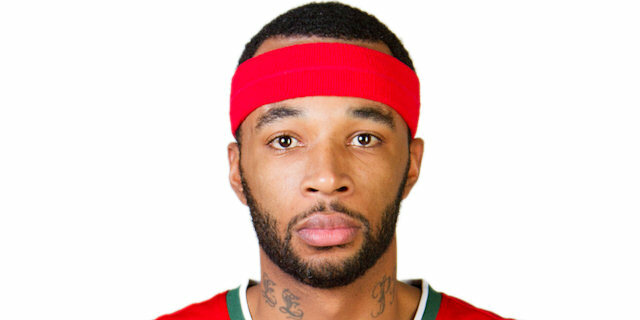 But Lokomotiv rallied behind Malcolm Delaney and Anthony Randolph to take and keep the lead down the stretch. Delaney finished with 19 points and 9 assists, while Randolph had 16 points, 7 rebounds and 3 steals. Chris Singleton added 10 for the winners. 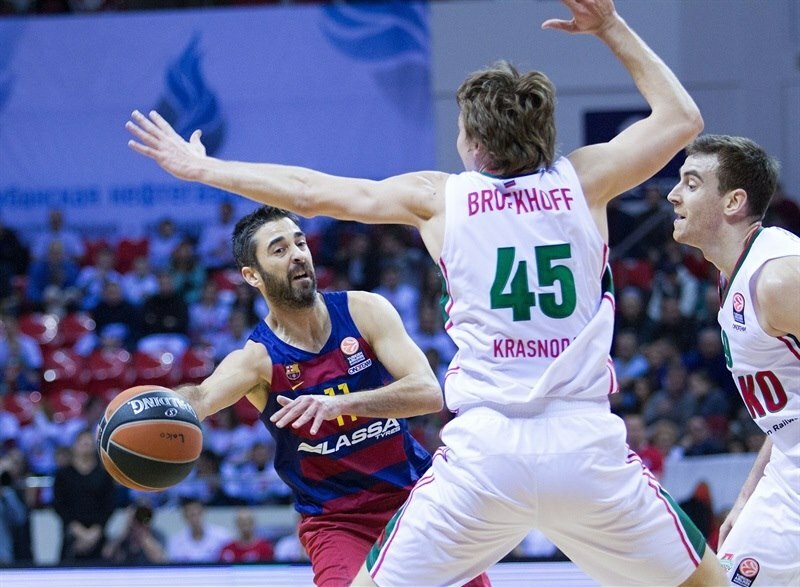 Navarro had 22 points, his most in a Euroleague game since the April of 2014, while Ante Tomic followed with 17 and 7 rebounds. Delaney used his speed to set up Kyrylo Fesenko for a slam and the game's first points. Tomic got the visitors going with a tip-in. Ryan Broekhoff nailed a triple from the corner to make it 5-2. Every shot and rebound was contested in the early going. After Navarro sank free throws, Justin Doellman's acrobatic layup gave the visitors their first lead, 5-6. Victor Claver drilled a triple at one end for Lokomotiv and Tomic answered with a slam-and-foul thanks to a great pass from Doellman to make it 8-9 midway through the quarter. Singleton came off the bench to knock down a baseline jumper that put the hosts on top, but Barcelona sub Aleksandar Vezenkov countered with a triple. Delaney knotted the game by penetrating and making a layup, but Stratos Perperoglou put Barcelona ahead despite getting rejected by Singleton on the next play. Broekhoff evened the score again at 14-14 with a jumper in the lane. Vezenkov connected again from downtown and Dontaye Draper countered with a long jumper. 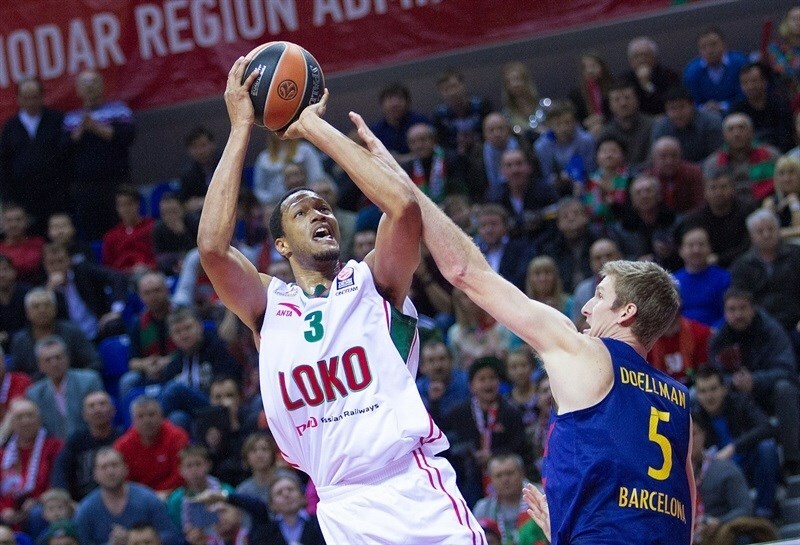 Randolph was fouled attacking the basket and his free throws made gave Lokomotiv an 18-17 lead after 10 minutes. Carlos Arroyo fed Shane Lawal for an impressive alley-oop slam to start the second quarter. Then Arroyo drove and dished to Pau Ribas for a three-pointer and an 18-22t lead. Randolph sank free throws and then his steal led to a Draper layup that tied the game. 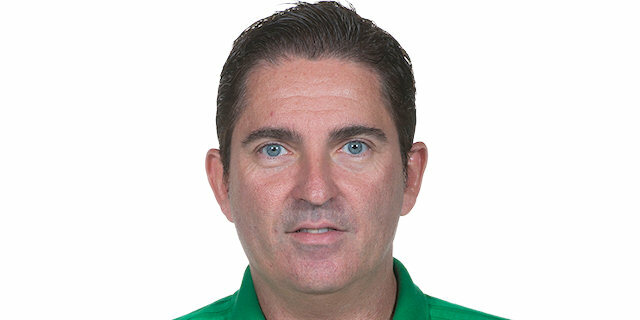 Brad Oleson was fouled shooting a three-pointer and made 2 of the resulting free throws for Barcelona before Andrey Zubkov countered with a layup, preserving a tie. 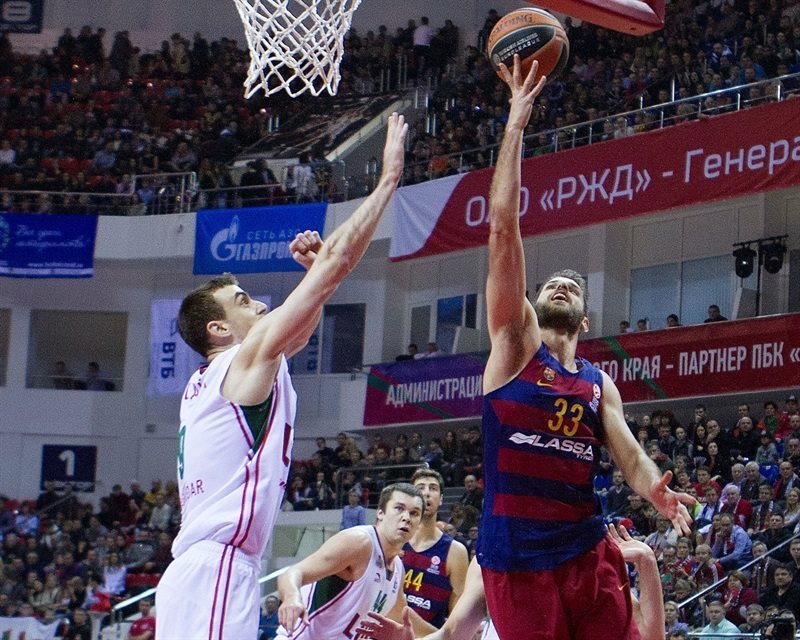 Ribas beat the 24-second clock with a triple that put Barcelona ahead 24-27 midway through the quarter. Singleton drained a jumper and after Arroyo split free throws and Zubkov made both of his, the score was even again, 28-28. Samardo Samuels scored twice in the paint and twice from the line as the visitors surged ahead. A steal and free throw by Tomas Satoransky boosted the difference to 29-35 at the break. 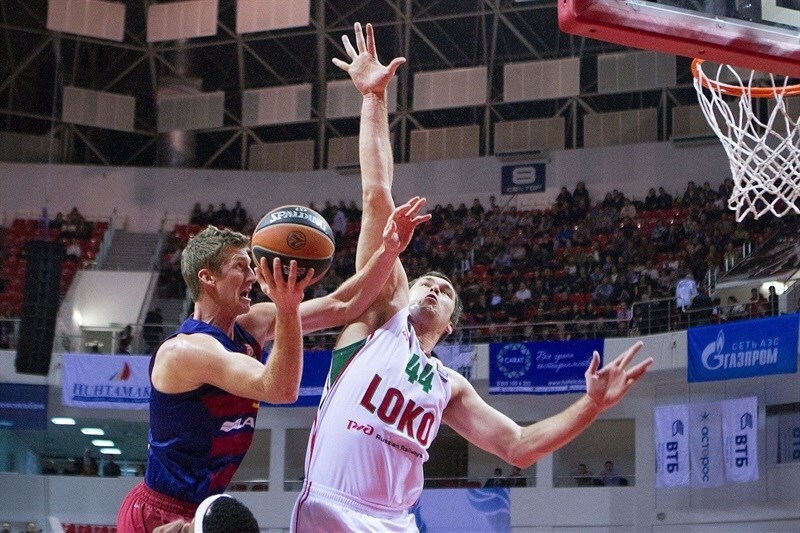 Fesenko tipped in a miss to start Lokomotiv's second half strong, but when Delaney fed him for a dunk at 33-35, Barcelona came the other way and did the same between Navarro and Tomic. However, Lokomotiv still got what it wanted, the lead, on a triple from the top by Delaney at 38-37. Navarro, the best three-point marksman in the business this century, answered in kind to take the lead back for the visitors. Claver was ready with his own answer from the arc for Lokomotiv and when Delaney scooped in a one-handed shot, the hosts were in front again, 43-40. Tomic got 2 points back for Barcelona on an up-and-under layup and then put his team up again on a lane jumper. Lokmotiv responded from long-range again - a triple by Broekhoff - but Navarro matched him with a "la bomba" shot over Fesenko and the free throw that came with it. Randolph became the home team's fourth three-point striker since halftime as the lead continued see-sawing. Next it was Tomic making his own inside shot and sending a no-look assist to Vezenkov before Navarro buried a triple in transition to suddenly launch Barcelona ahead 49-54, forcing a Lokomotiv timeout. Randolph rebounded his own miss and dropped it back at 51-54, but Navarro was feeling it and drilled another three-pointer, this one from the top. And he wasn't done. Between a free throw and a lane basket from Randolph, Navarro shook off a defender and quick-fired his fourth three-pointer since halftime to send Barcelona up 54-50 after 30 minutes. Barcelona again found the hot hand, Navarro's, to start the fourth quarter with his fifth three-pointer in 10 minutes for the game's biggest lead, 54-63. Singleton got a second-chance basket and a steal between two-pointers by Delaney as Lokomotiv reeled back the difference. Vezenkov made a beautiful pass to Tomic at 60-65, but after Randolph dropped a shot from the lane, Draper was soon finishing a broken play with a game-tying triple that brought the crowd to its feet at 65-65. Satoransky's free throws couldn't keep Barcelona safe, as Delaney was ready with a go-ahead triple from the wing at 68-67. As the Lokomotiv defense held, Singleton added a tough basket to the lead, but Navarro got those points back easily at the free throw line. Then Navarro drew all the defensive attention to himself and fed Doellman in the corner for a go-ahead triple at 70-71 with 2 minutes left. Singleton re-took the lead with a baseline jumper and then Delaney hit a layup falling down to make it 74-71 early in the final minute. 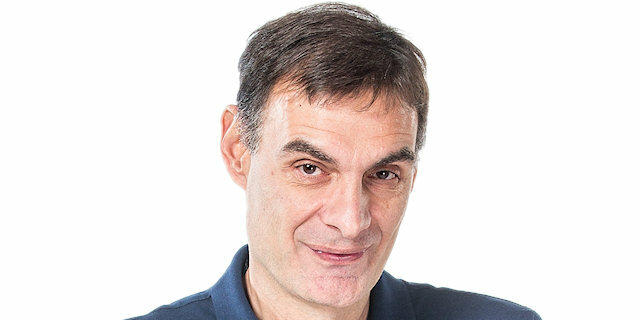 After a Barcelona timeout, Navarro missed a triple, but Tomic got the foul line with the offensive rebound to trim the difference to 74-73 with 36 seconds left. Randolph got the next offensive rebound and was fouled, hitting both free throws with 7.8 seconds left to make it 76-73. Out of timeout, Arroyo gave up a three-pointer and then got fouled. He hit the first, missed the second, and Lokomotiv came up with the rebound to send Delaney to the foul line, where he made both shots for a 78-74 victory and first place in Group C.
"We’re proud of this win and the way we play in the Euroleague in general. We took first place in a very difficult group and showed the whole of Europe our potential, while building the best defense in the Euroleague. This is the key to our success. Today we started sharing the ball on offense at the right time and stuck to our defense. Barcelona made successful runs on offense, but we were able to respond with even better defense. Of course it may be hard to stop Navarro when he is playing like this; he’s a great player and has been like this for his all career. But we played generally good defense and it carried us in the key moments. I want to say thanks to my team and everyone and invite our fans to the Top 16. I believe they will see some great games and keep supporting us the way they did today!" 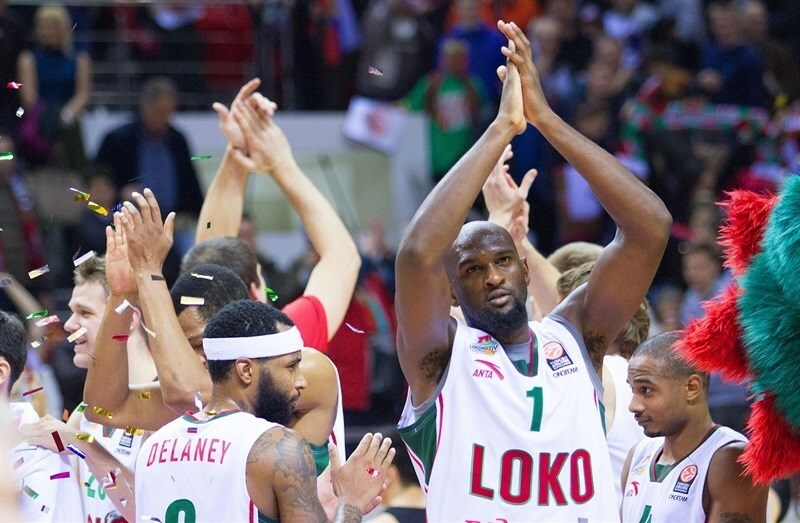 "I want to congratulate Lokomotiv Kuban with this win. It was a spectacular game for the fans. Our problems started in the second half, our defense got worse compared to the first. Also the keys to our loss were turnovers and offensive rebounds by Lokomotiv." "I think we just stayed resilient through the game, even though they made a few runs. We just proved how much better we got compared to our first game in Barcelona. They did exactly the same thing. But we couldn’t close the game then. And this time we just got the stops when we needed them and in the fourth quarter shared the ball, found the right guys in the right spots and they were hitting big shots." "I think we played a good game on the road but had a very bad fourth quarter. We didn't control the game, had a lot of turnovers, they were better than us and the 10-point difference in the fourth quarter hurt us a lot. We were up by 8-9 points but had three turnovers and three bad defenses. After that, we had chances to return to the game but they grabbed three offensive rebounds. It was a bad fourth quarter for us. It has happened to us a lot in the last few games - we have a game under control and our opponent comes back. We disappeared on offense and defense. When you don't score, you have to be strong on defense."